You cannot always prepare good stuff at home. Not always. But you can do that most of the times. With the right ingredients and knowledge, you can make wonderful things at home. You can save money. And you can be assured that they are natural. Like, for example, apple cider vinegar. Or, the magic liquid, as some would like to call it. 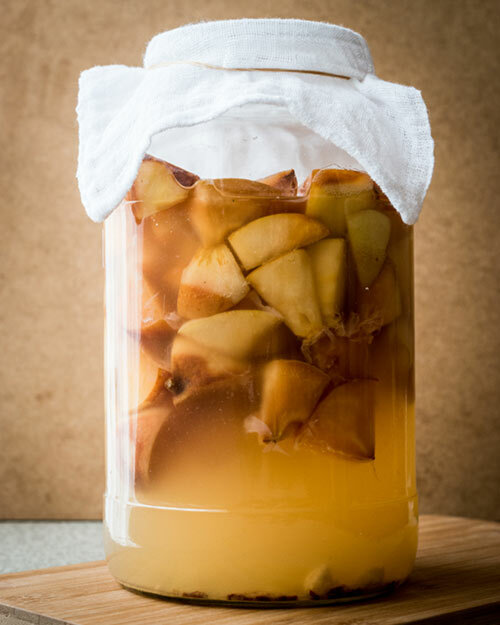 But how do you make homemade apple cider vinegar? That’s what we will discuss in this post. Keep reading! What Is So Good About Apple Cider Vinegar? It is hard to find someone who wouldn’t have heard of apple cider vinegar. But it’s easy to find one who hasn’t started using it yet – for most of us aren’t aware of the ways it can be beneficial to us. Also known as cider vinegar, it is a type of vinegar prepared from cider. It has a pale to medium amber color and is made by crushing apples and squeezing out the liquid. Apple cider vinegar is generally used in salad dressings, food preservatives, and chutneys, amongst a few other dishes. And what makes it good, obviously, are its benefits. Studies have shown that ACV can help regulate the blood sugar levels and prevent diabetes (1). The acetic acid in ACV might also break down the fat in the body and eventually prevent weight gain. ACV can also be beneficial to digestive health. These are a few of the ways ACV can make your life better. We have more as well (will look at them later). But now comes the most important question – how do you select apples for your vinegar? Because it all boils down to choosing the right kind of apples. The first thing you need to keep in mind is the word ‘organic’. Yes, organic apples are what you must choose to prepare this tonic. By doing so, you will ensure your ACV is free of pesticides, which might obstruct the fermentation process and cause undesirable results. You can get your organic apples from your local market. Here’s what you need to do – every time you eat apples or prepare apple pie or anything with apples, store the cores and peels of the fruit in a tightly sealed container in the freezer. You must first wash the apple peels thoroughly in water and discard the bad ones. And if you cannot find organic apples, you can discard the peels of the fruit and just use the cores for your vinegar. …The fermentation process – is what we are going to see now. Take about 10 organically grown apples and wash them thoroughly in running water. Using a kitchen knife, slice the apples into quarters. Keep the cut apples aside and let them rest at room temperature. Wait till they turn brown. Add the cut brown apples to a wide-mouthed glass jar. Add water to the jar so that the apples are covered. Cover the jar with a cheesecloth. But ensure it is not tightly secured. The cloth must rest lightly on the top so that the mixture gets more oxygen. Store this covered jar in a warm and dark place. Leave the jar the way it is, covered, for about 6 months. Stir once a week. Post the 6-month fermentation period, take the jar out. You will find a layer of scum on top of the liquid. This is due to normal bacteria and is formed as alcohol turns into vinegar. Take another wide-mouthed glass jar, and filter the liquid through the cheesecloth. Do this until all the liquid from the first jar is transferred into the second jar. Use the same cheesecloth to cover the new jar of liquid. Keep the jar in a warm and dark place for another 5 to 6 weeks. Transfer the completely fermented ACV into smaller containers if you want to. Cover them and store in the refrigerator for prolonged freshness. As you prepare diy apple cider vinegar, there is one thing to be kept in mind – use extremely clean containers. If not, you would only be introducing bad bacteria to your ACV that can cause mold growth. On top of it, it can also obstruct the growth of beneficial bacteria. Wash all the containers you are going to use with hot, soapy water. More importantly, scrub your hands and nails clean before beginning the process. 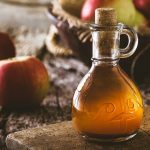 What is the purpose of preparing homemade apple cider vinegar? Definitely for its benefits, right? What are they? We have already seen this in brief. The most successful application of vinegar till date is to treat type 2 diabetes. More important, ACV, as we have discussed, helps keep the blood sugar levels stable. This helps prevent not just diabetes, but other chronic ailments associated with high sugar levels. ACV contains acetic acid, which has shown to lower blood sugar levels (2). According to another American study, vinegar has antiglycemic properties (3). Another Swedish study stated that fermented foods could be included in the diet to reduce insulin demand (4). Did you know that heart disease is the number one killer in the world? Most people lose their lives to cardiac disease than to any other ailment (5). Certain studies on rats showed that including acetic acid in the diet can reduce cholesterol levels (6). Acetic acid and vinegar were also found to reduce the blood pressure, which is a major contributor to heart attacks (7). ACV has been found to break down and reduce the mucous in your body. It also possesses antibacterial properties that help treat sinuses (8). The antibacterial properties of ACV can help treat sore throat as well. All you need to do is mix one-third cup of ACV with warm water and gargle. Applying ACV topically can help remove warts, given its high acetic acid content. Simply soak a cotton ball in ACV and apply it to the wart. Cover it overnight. ACV has specific uses for the skin as well. The tonic can act as a natural antifungal treatment and can help treat nail fungus. You can apply the vinegar to the affected area with a cotton ball twice a day. And, given its antibacterial properties, ACV can help clean the skin pores of oil and bacteria. It detoxifies the skin, reduces swelling, and removes excess oils. You can also treat bug bites and other allergies using ACV. It reduces inflammation associated with such issues. There are two types of vinegar – filtered (that also is likely to be pasteurized), and unfiltered (and unpasteurized). Filtered ACV is simply made from apple juice and water. The filtration process removes ‘the mother’ and other sediments, and you get a clear and amber-colored vinegar. As it is also likely to be pasteurized, the vinegar is further refined and clarified. In the case of unfiltered ACV, yes, it also is made from apple juice and water. But it has ‘the mother’. It isn’t filtered and is more likely to be unpasteurized. It appears a little cloudy and can contain small amounts of sediment. The Mother. What is it? ‘The mother’ is basically strands of enzymes, proteins, and friendly bacteria that render the vinegar a murky and cobweb-like appearance. Though people often believe The Mother is responsible for most of ACV’s benefits, there are not enough studies to back this claim. But yes, speaking in terms of naturalness, unfiltered and unpasteurized apple cider vinegar with ‘The Mother’ gets the upper hand. It is organic. 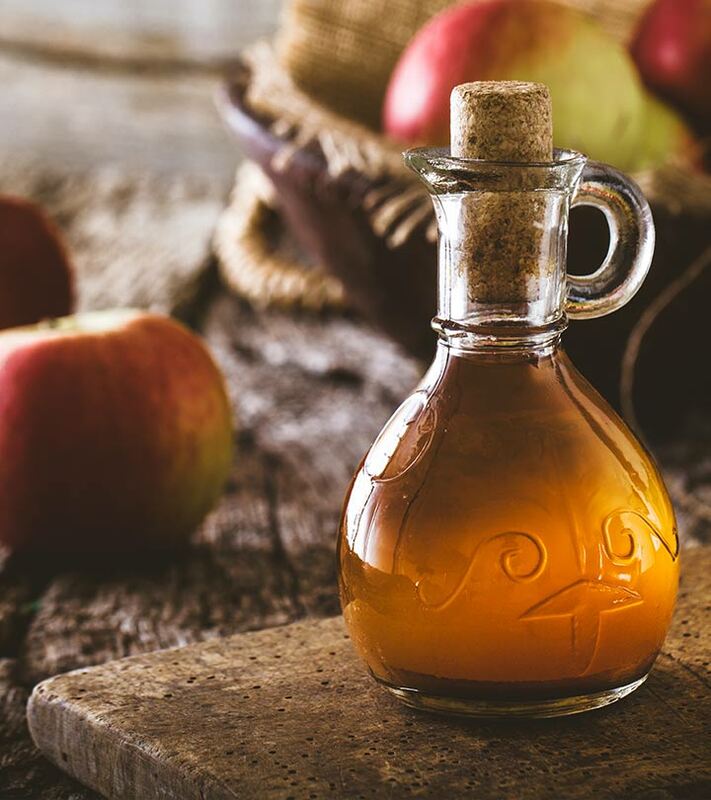 Though both types of vinegar are used interchangeably from a culinary point of view, if you are a stickler for natural foods, ACV with ‘the mother’ is what you need. Simple. Mix one part of ACV with three to four parts of water. Using a cotton pad, apply the mixture to your face and leave it on for about 10 minutes. Rinse. Repeat thrice a day. This can be annoying. And if you can’t keep the cat away, what do you do? Dip a cotton ball into a little ACV and rub it on the chords every 4 to 5 days. Add a thin layer of ACV in a cup with a drop of dish soap. Place it on the counter. The fruit flies will fly in and get stuck. Add half a tablespoon of ACV to a cup of water. Gargle for 10 seconds at a time until the cup is empty. Exercise causes the build-up of lactic acid in your body, which causes exhaustion and fatigue. But the amino acids in ACV can serve as an antidote. You can add a tablespoon of ACV to a glass of water after working out. You have learned about preparation of apple cider vinegar and its types. 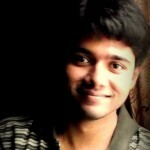 Let’s now take a look at a few frequently asked questions. What is the difference between white cider vinegar and apple cider vinegar? White vinegar is distilled from grains. It has a high acidity level and high clarity that make it an ideal cleaner. Apple cider vinegar, as the name suggests, is made from apples. It is used to make pickles and add tang to bland foods. But what set cider vinegar (especially apple cider vinegar) apart are its health benefits and healing properties. Are you supposed to refrigerate apple cider vinegar? Yes. To preserve the quality and flavor of the vinegar, it is best to keep it in a cool and dark place. Preferably, inside your refrigerator. What is the best way to store apple cider vinegar? In a cool and dark place. You must keep the lid tightly closed. And as already discussed, it can preferably be stored in the refrigerator. What are the different ways to take ACV? Add 2 tablespoons of ACV to a cup of fruit juice and take it. You can also use 2 tablespoons of ACV as a salad dressing. You can even intake apple cider vinegar with your evening snack. Take a small cup of ACV along with your snack. Does apple cider vinegar contain alcohol? Not after the fermentation process when the ACV is ready for use. The bacteria converts the already-existing alcohol into vinegar. Both usually mean the same. But cider vinegar could also be made from other fruits, like raspberries, in which case it is called raspberry cider vinegar. When can I take apple cider vinegar? You can either drink it in the morning on an empty stomach or at night before dinner. If any other routine works better for you, you can follow that. What are the best brands of ACV? One very popular brand of ACV is Bragg Organic Raw Apple Cider Vinegar. A few others include Eden Foods Organic Apple Cider Vinegar, Heinze Apple Cider Vinegar, and Viva Naturals Organic Apple Cider Vinegar with the Mother. If I want to buy ACV, what is the best option? You can buy online – you can purchase apple cider vinegar from any online organic store or Amazon. So now you know how to make your own apple cider vinegar easily. When you can prepare something as healthy as ACV right in your kitchen, why go buy it outside? Makes sense, doesn’t it? Start preparing your own homemade apple cider recipe today, and get ready to welcome a healthy lifestyle. Also, let us know how this post on homemade apple cider vinegar has helped you. Do comment in the box below.